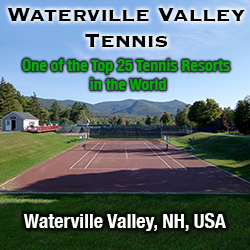 New England Tennis Holidays in N. Conway has a long history of running camps here, originally on the red clay at the Mount Cranmore Racquet Club. Those outdoor courts are gone now, however, so NETH has implemented a program of customizing tennis retreats for groups of four or more. New England Tennis Holidays now offers custom tenis camps for groups of 4 or more, leaving participants to choose their own lodging. Seasons. The programs at North Conway run on a customized basis from from May to mid September. Travel Instructions. The nearest airport is Portland, Maine, an hour and 15 minutes' drive to the south. NETH can arrange for a shuttle to pick you up and make sure you have a ride back and forth from your lodging to dinner, but in truth you'll probably be happier with the freedom that comes with having your own transportation. General Tourist Information. Visit the Mount Washington Valley chamber of Commerce website or the New Hampshire Office of Travel & Tourism website.